Deanna Shrodes: Marsha, Marsha, Marsha! 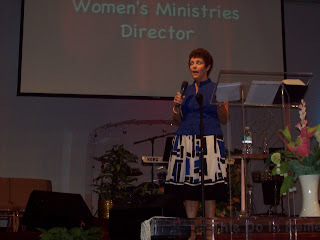 As heard in Brady-land, or....Florida if you are involved in women's ministries! Today was the "Day of Refreshing" for Tampa Assemblies of God Women. I'm the Tampa women's ministries leader and head up events for the churches in our section as well as make myself available to help other leaders. At least that is part of the job description. I love helping others! I love serving! Today was our latest event, and we started with breakfast this morning at 9:00 and four workshops taught by area leaders. We have some great leaders in our area. After the workshops, we moved on to a service all together in the sanctuary and our special speaker today was Marsha Woolley, our women's director for Florida. The woman can preach the wallpaper off the walls, I'm tellin' you! She's something else. If you've never heard her preach, and you ever have the opportunity, TAKE IT! She delivered a powerful word and ministered in the altars, and woww-eeeeeeeeeee as usual! She did have a word for me which I'll have to go back and listen to the CD to get the full thing. Does anyone besides me experience the "surreal" feeling when you are receiving a word? It blurs together because you are so in the moment. I do remember three things- the word was that I have gone through a lot, and I'm getting ready for a whole new level...and it's going to AMAZE me, and two other particular words that stood out were faithful and diligent. She said, "you've been faithful...you've been diligent...and THIS IS YOUR YEAR!!!" I receive that. Yes, yes, yes. If there's two things I strive to be it's faithful and diligent. I just did a teaching for two leadership meetings on diligence because God has been speaking to me so much about it recently. What a lack of it there is in our society today and especially in the younger generation, and we mothers in the faith must rise up to model diligence as never before! Sometimes it is difficult because we feel like we are alone in doing this, but we must always go beyond feelings, beyond what we see around us, and do what we know is right, and God will reward. Praise His name! Our workshop speakers - Andrea Beverly, Pam Newman, Dotty Petty, Lennette Deal and Rosemay Latortue did an outstanding job! The women were so blessed! I can't wait to hear all the CD's!!! The worship team/choir did great. I was proud of them. After the service Marsha and I went out and shared a few hour lunch. It was awesome. We laughed, we cried. We really got to share our hearts and it meant so much.